Kindly choose below option if you need scanned copy of your order before final shipment of hard copy. Please Note: Scan copy for “Karnataka Examination Authority” Orders shall not be entertain due to bulk-requirement going on.Hence, please do not choose scan copy option. Note: Customer can purchase only 2 e-stamp papers in total from portal. For more requirement, Kindly place a request at right topmost option of Bulk Order Request. Kindly Provide us your Details and we will get back to you. STEP 1-Fill the Form & Click on Add to Cart. STEP 2- Select the Mode of Shipping and Make Payment. STEP 3- Delivery of your e-Stamp Paper at your place. e-Stamp Paper means paying Stamp Duty to Government electronically. Currently, In 18 States there is e-Stamp Paper forwarded by Stock Holding Corporation of India Limited (SHCIL). 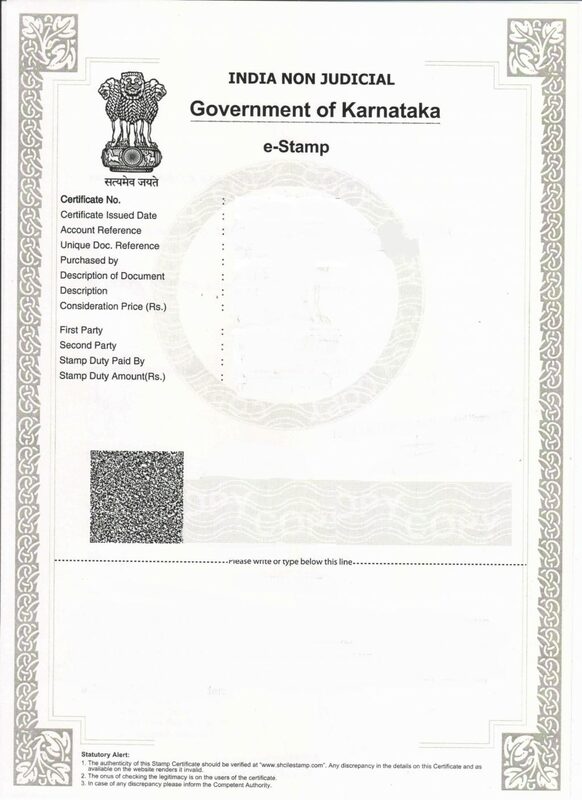 The Karnataka State Government introduced the e-stamping system in the state in 2008. The Prevailing system of Stamp Paper has been replaced and stopped by Government and now there is only e-Stamp Paper which is more secure and reliable as compare to prevailing system of Stamp Paper. 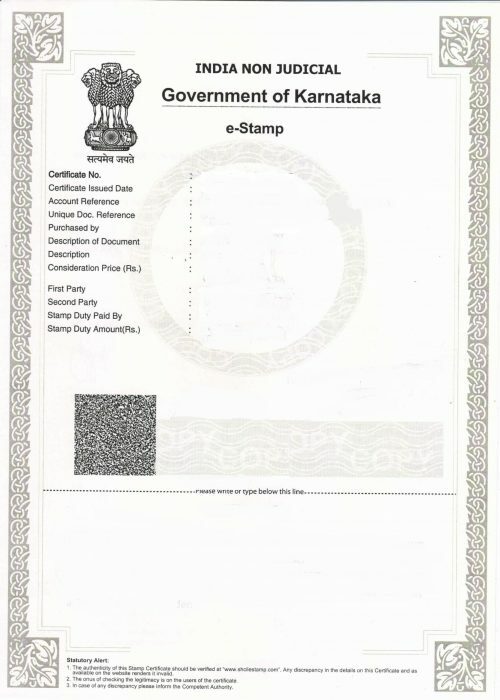 Does the e-Stamp Paper purchased in one state can be executed in another state? No, Only authorized Banks/ACC Centers can generate e-stamp paper online. Citizens cannot generate e-Stamp Paper by there-selves. They have to approach either to the authorized Banks or to the ACC Centers of Karnataka state to get e-Stamp Paper. 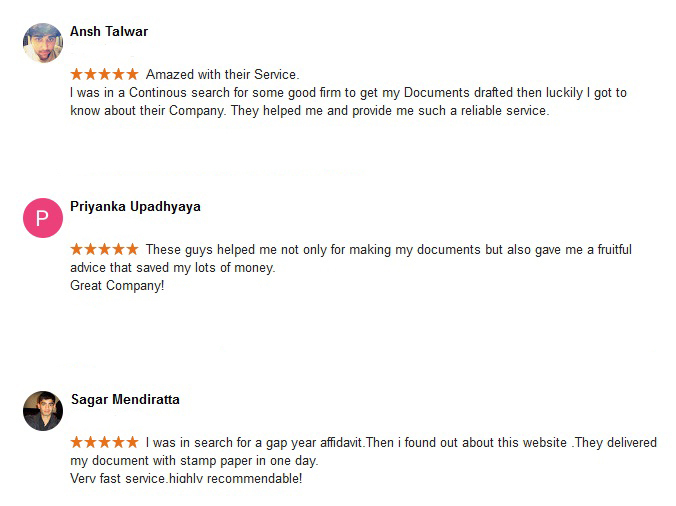 You can also avail e-Stamp Paper easily through our online portal. Where can we buy Stamp Paper in Bangalore? You can buy Stamp Paper from SHCIL Centers OR from Authorized Banks. The Easiest way to purchase e-Stamp Paper is through our Portal. Just Fill the above provided Form and we will deliver your Stamp Paper to you. What is the value of stamp paper for Rental Agreement in Bangalore & Karnataka? You can prepare the Rental Agreement on e-Stamp Paper of Rs. 100 or Higher. The duty chargeable varies depending upon the amount of rent, lease period and lease granted for amount advanced etc. Kindly go through the Article for details. If there is no Second Party, then you can write NIL/Not Applicable while filling the Form and the e-stamp paper shall be generate accordingly. You can just simply place your request while clicking the link provide on the right top and we will get back to you with the impressive and quick service for Bulk e-stamp paper.